James Rhio O’Conner found out on October 15, 2001 at the age of 60, that he most likely has lung cancer. In order to find out exactly what kind of cancer he had, he had to wait two weeks for the test results to get back from the lab. Once he got his results he could find out his options to treat this type cancer. Not really worrying about it, O’Conner waited out the two weeks but heard nothing from the doctors. So he went down to the hospital to get some answers, but his surgeon was gone. The surgeon was going to be gone on vacation for about another week, so he had to wait until the surgeon came back so he could read his results. After about ten days, he went down to get his staples removed and to find out the results. His surgeon told him it was mesothelioma. All the surgeon knew was that it was cancer and that he would have to talk to an oncologist to find out more about his cancer and his treatment options. Of course the next available appointment was in two weeks. When the time came he met up with the oncologist, he explained to him and his wife, that it was a “terminal cancer”, which he had less than a year to live. According to his surgeon, the typical cancer treatments including radiation, chemotherapy and surgery would not be an option for him. Surgery was not an option because his cancer was located where they would have to remove parts of his backbone which is an unacceptable risk. Radiation wouldn’t work because his cancer was so widespread that they would have to radiate his entire chest cavity. Chemo would just make him sicker and would only give him a few more months to live which, wouldn’t be worth his while. When O’Conner asked him about alternative medicine like “Vitamins, herbs, diet and those types of things?” He said “Don’t waste your money on those quacks.” The doctors told him to spend his money wisely, go do things he’d never done, take his wife on a cruise. During the next few months, James O’Conner had taken a different approach based on self reliance. He focused on strengthening his body, through diet, vitamins and other supplements. This approach took a lot of knowledge, commitment and discipline. About seven months later in June 2002, he went back to the doctors to find out how his cancer was doing. The doctors insisted that he get an X-Ray, but from what he had read, an X-Ray didn’t give a very clear view of the changes in his cancer compared to a cat scan (CT). He insisted on a CT. By comparing the two CT’s taken, the tumors were regressing. By the ninth month, when he was supposed to be in his death bed, he was actually better. The cancer was not gone, but the method he used was to keep him alive by not allowing it to spread. James Rhio O’Conner is a very strong man that has a lot of determination. If I was faced with a dire cancer prognosis, I would do my research before I made a decision like chemo or surgery. By becoming very familiar with my cancer, it will allow me to make an informative decision on how to treat my cancer. There is no way I would choose chemo, because it’s killing yourself till you have nothing left then trying to build your body back up to health. This may work for some people but after watching one of my grandmothers go through chemo, I wouldn’t want to put myself through it. I would conduct my research by talking to other patients, doctors and nutritionist. By talking to a nutritionist, you can find out what kind of vitamins’ your body needs to help fight your type cancer. I would also talk to other patients like James did to get advice and inspiration. 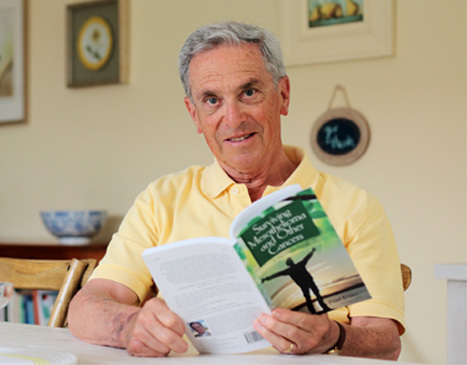 James interviewed Paul Kraus, a survivor of mesothelioma of eleven years which clearly inspired him to continue his research and diet. By getting support from other patients really encourages you by knowing that you’re not alone in this fight. I would want to find the healthiest, safest method that is available to treat my cancer. If the doctors didn’t give me any options, I would do exactly what O’Conner did; research to find a way to stay alive as long as I can. O’Conner surprised the doctors by taking his life into his own hands. Seven and a half years after he was given a year to live, he passed away July 11, 2009 at 69 years old. His story is a great inspiration to whoever is dealing with cancer, and going through this tough fight. Cancer is a scary thing that many people have to go through in life, and everyone is affected by losing their loved ones. It is the toughest thing for me to watch someone suffer from cancer. My only wish is that someday soon, they will find a cure.